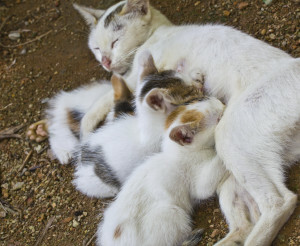 Did you know that a pair of uncontrolled breeding cats plus all their kittens and their kittens’ kittens, if none are ever spayed or neutered, can add up to over 80 million in ten years! As many as 3,000 dogs and cats are born in the United States every hour. According to the U.S. Census Bureau, 450 U.S. citizens are born every hour. There is no way that responsible pet parents could assume care for that many excess animals, even if each one of those 450 people was to adopt a dog or cat. Every year in the U.S. approximately 7.6 million cats and dogs are euthanized because lasting, loving homes cannot be found for them. You can help end this tragedy by making sure your pet doesn’t contribute to the surplus of dogs and cats.